Looks like the resourceful people over at Bristol Street Art have perhaps confirmed what has been suspected to be the location of Banksy’s surprise show – Bristol’s City Museum on Queen’s Road.Â They went as far as taking a picture through the small gap in the front doors.Â According to them, it looks like something Banksy did in 2007 in Glastonbury.Â Apparently a private viewingÂ “may”Â be held on the 12th of JuneÂ with a public viewing starting on the 13th of June (usual museum opening hours 10 am â€“ 5 pm).Â Nothing 100% confirmed yet, but with the location, content, and time matching, it seems more than likely the info is spot on.Â Plus, it’s sounding highly suspicious that the museum will be closed on the 11th & 12th when they are usually open 7 days a week (stated on its website). Categories: Art, Installation, Shows & Events, Street & Urban Art. 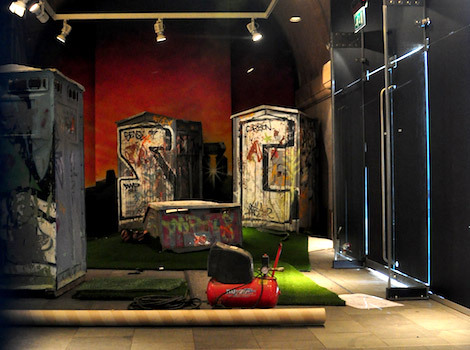 Tags: Banksy, Banksy - Bristol Museum, Installation, Shows & Events, Street & Urban Art.